What really happened when Swedes tried six-hour days? Sweden has been experimenting with six-hour days, with workers getting the chance to work fewer hours on full pay, but now the most high-profile two-year trial has ended - has it all been too good to be true? Assistant nurse Emilie Telander, 26, cheers as one of the day patients at Svartedalen's elderly care home in Gothenburg manages to roll a six in a game of Ludo. But her smile fades as she describes her own luck running out at the end of the year, when after 23 months of six-hour shifts, she was told to go back to eight-hour days. "I feel that I am more tired than I was before," she reflects, lamenting the fact that she now has less time at home to cook or read with her four-year-old daughter. "During the trial all the staff had more energy. I could see that everybody was happy." 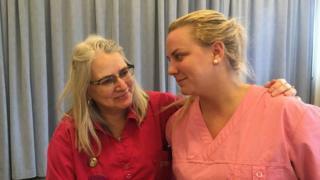 Ms Telander is one of about 70 assistant nurses who had their days shortened for the experiment, the most widely reported of a handful of trials in Sweden involving a range of employers, from start-ups to nursing homes. Designed to measure well-being in a sector that's struggling to recruit enough staff to care for the country's ageing population, extra nurses were brought in to cover the lost hours. The project's independent researchers were also paid to study employees at a similar care home who continued to work regular days. Their final report is due out next month, but data released so far strongly backs Ms Telander's arguments. During the first 18 months of the trial the nurses working shorter hours logged less sick leave, reported better perceived health and boosted their productivity by organising 85% more activities for their patients, from nature walks to sing-a-longs. However, the project also faced tough criticism from those concerned that the costs outweighed the benefits. Centre-right opponents filed a motion calling on Gothenburg City Council to wrap it up prematurely last May, arguing it was unfair to continue investing taxpayers' money in a pilot that was not economically sustainable. Saved from the axe at the eleventh hour, the trial managed to stay within budget, but still cost the city about 12 million kronor (£1.1m; $1.3m). "Could we do this for the entire municipality? The answer is no, it will be too expensive," says Daniel Bernmar, the Left Party councillor responsible for running Gothenburg's elderly care. But he argues the experiment still proved "successful from many points of view" by creating extra jobs for 17 nurses in the city, reducing sick pay costs and fuelling global debates about work culture. "It's put the shortening of the work day on the agenda both for Sweden and for Europe, which is fascinating," he says. "In the past 10, 15 years there's been a lot of pressure on people working longer hours and this is sort of the contrary of that." Yet while work-life balance is already championed across the political spectrum in Sweden, the chances of the Nordic country trimming back its standard 40-hour week remain slim. On a national level, the Left Party is the only parliamentary party in favour of shortening basic working hours, backed by just 6% of voters in Sweden's last general election. Nevertheless, a cluster of other Swedish municipalities are following in Gothenburg's footsteps, with locally funded trials targeting other groups of employees with high levels of illness and burnout, including social workers and hospital nurses. Cleaners at Skelleftea Hospital will begin an 18-month project next month. There's also been an increase in pilots in the private sector, with advertising, consulting, telecoms and technology firms among those testing the concept. Yet while some have also reported that staff appear calmer or are less likely to phone in sick, others have swiftly abandoned the idea. "I really don't think that the six-hour day fits with an entrepreneurial world, or the start-up world," argues Erik Gatenholm, chief executive of Gothenburg-based bio-ink company. He is candid enough to admit he tested the method on his production staff after "reading about the trend on Facebook" and musing on whether it could be an innovative draw for future talent. But the firm's experiment was ditched in less than a month, after bad feedback from employees. "I thought it would be really fun, but it felt kind of stressful," says Gabriel Peres, as he slots a Petri dish inside one of the 3D printers he's built for the company. "It's a process and it takes time and when you don't have all that [much] time it kind of feels like skipping homework at school, things are always building up." On the other side of the country, his concerns are shared by Dr Aram Seddigh, who recently completed his doctorate at Stockholm University's Stress Research Institute and is among a growing body of academics focusing on the nation's shifting work patterns. "I think the six-hour work day would be most effective in organisations - such as hospitals - where you work for six hours and then you just leave [the workplace] and go home. "It might be less effective for organisations where the borders between work and private life are not so clear," he suggests. "This kind of solution might even increase stress levels given that employees might try to fit all the work that they have been doing in eight hours into six - or if they're office workers they might take the work home." Back in Gothenburg, Bengt Lorentzon, the lead researcher for the Svartedalen care home project, argues that the concept of six-hour days also jars with the strong culture of flexible working promoted by many Swedish businesses. "A lot of offices are already working almost like consultancies. There's no need for managers to have all their workers in the office at the same time, they just want to get the results and people have to deliver," he says. "Compare that to the assistant nurses - they can't just leave work to go to the dentist or to the doctors or the hairdressers." "So I don't think people should start with the question of whether or not to have reduced hours. "First, it should be: what can we do to make the working environment better? And maybe different things can be better for different groups. "It could be to do with working hours and working times, but it could be a lot of other things as well." Listen to Maddy Savage's report on Sweden's experiment with six-hour days on The World Tonight.